View of courtyard towards entrance. 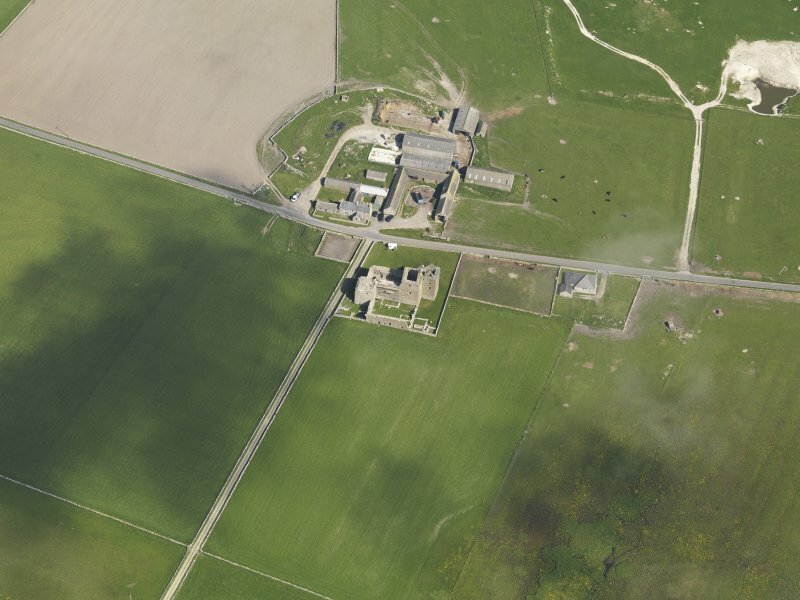 Oblique aerial view centred on the ruins of Noltland Castle with Noltland farmsteading adjacent, taken from the W.
Oblique aerial view centred on the ruins of Noltland Castle with Noltland farmsteading adjacent, taken fromt he WNW. 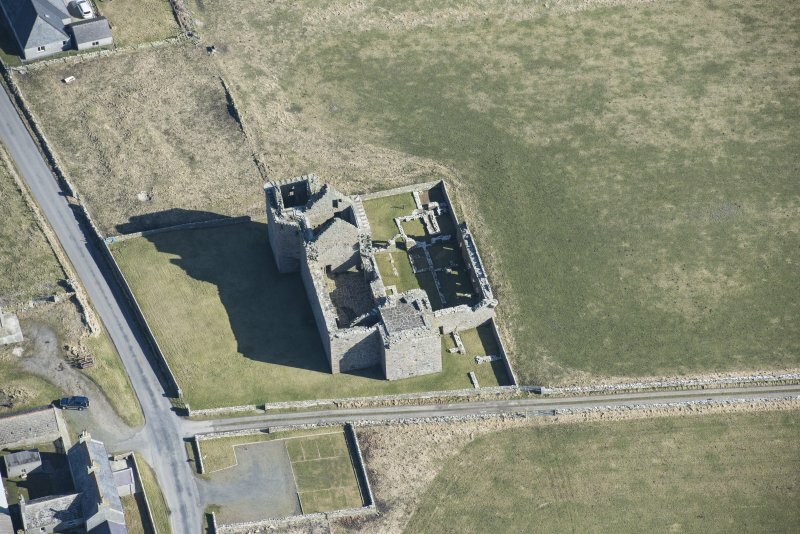 Oblique aerial view centred on the ruins of Noltland Castle, Westray. 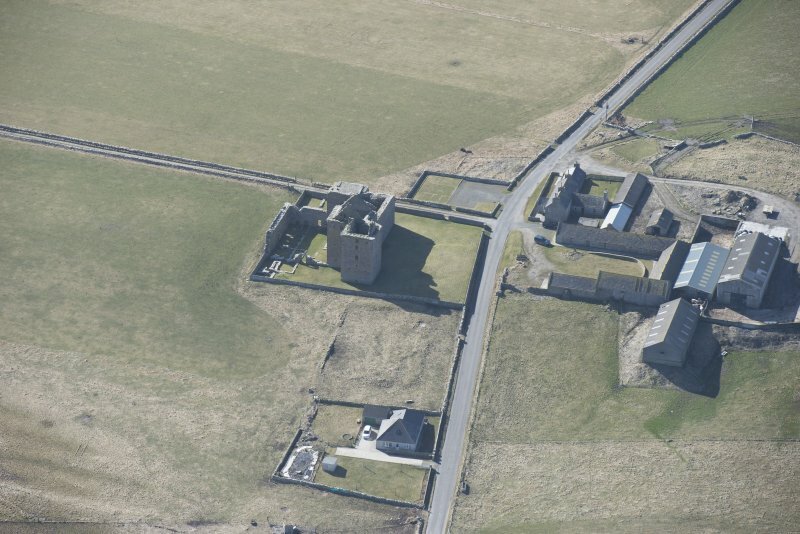 Oblique aerial view centred on the ruins of Noltland Castle, Westray with Noup Head Lighthouse visible in the background. Interior. Detail of head of newel. Interior. 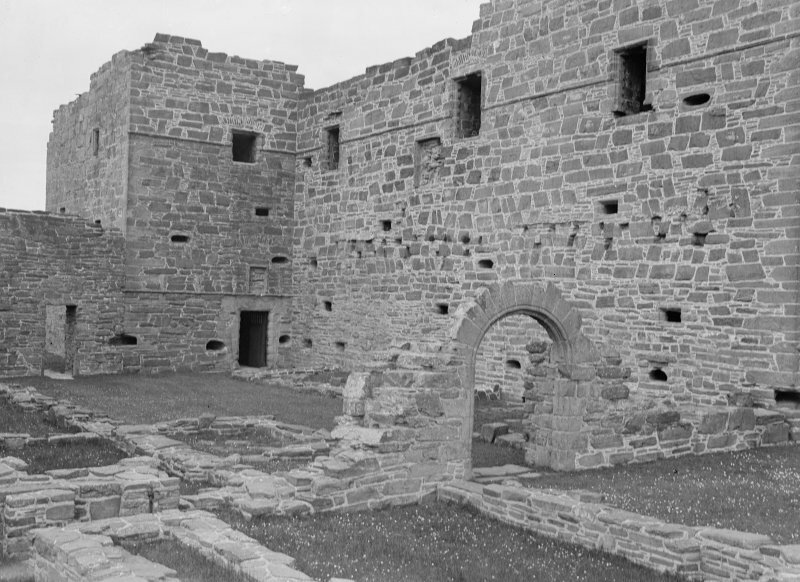 View of kitchen and storehouse. 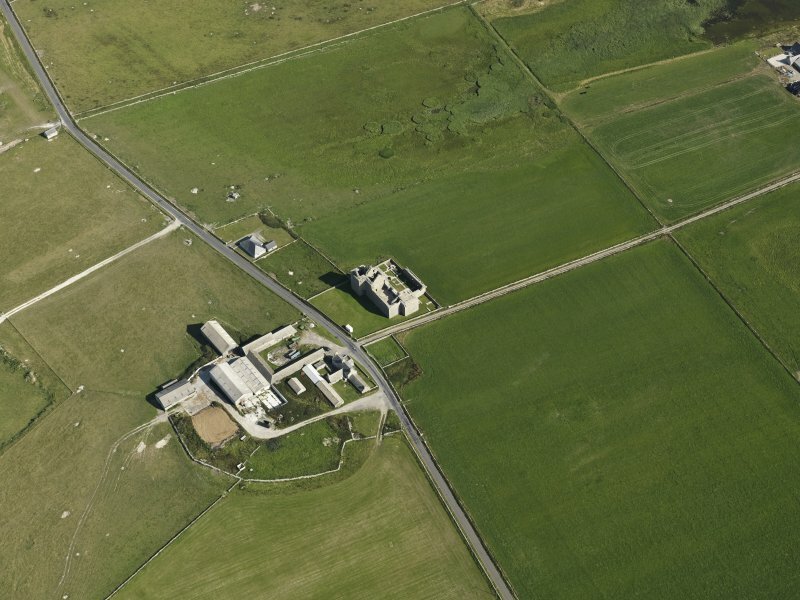 Oblique aerial view centred on the ruins of Noltland Castle with Noltland farmsteading adjacent, taken from the NW. 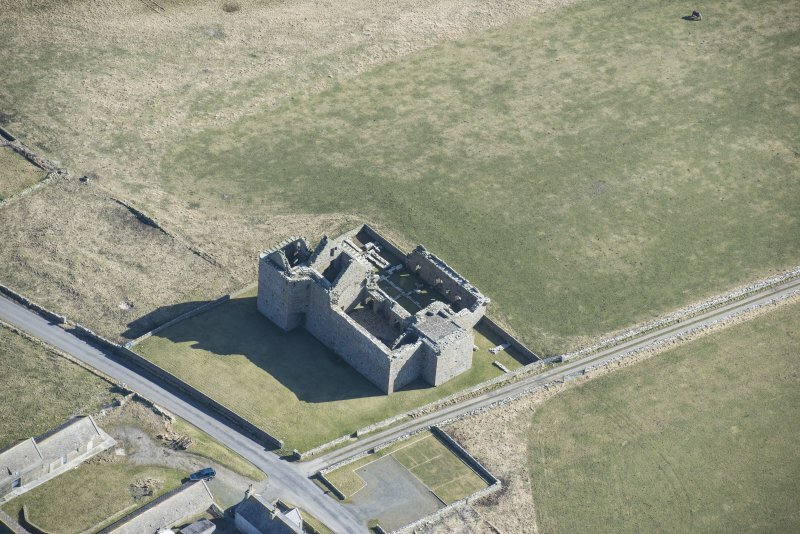 Oblique aerial view centred on Noltland Castle, taken from the SE. 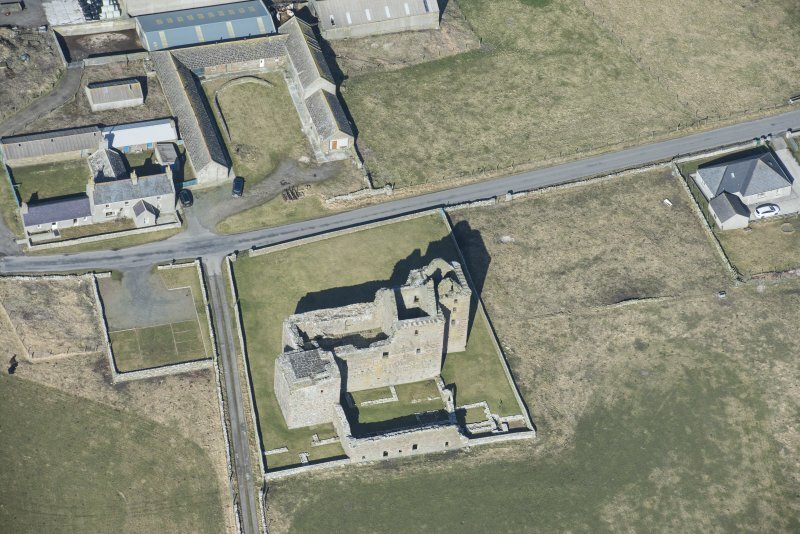 Oblique aerial view centred on Noltland Castle, taken from the SSE. 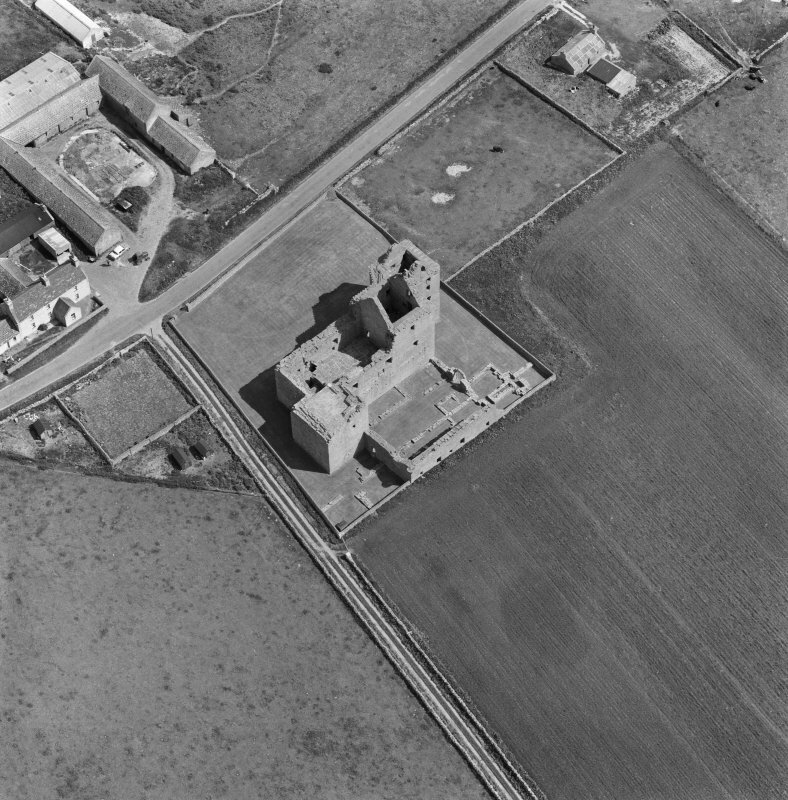 (HY 4293 4870) Noltland Castle (NR) (In Ruins). 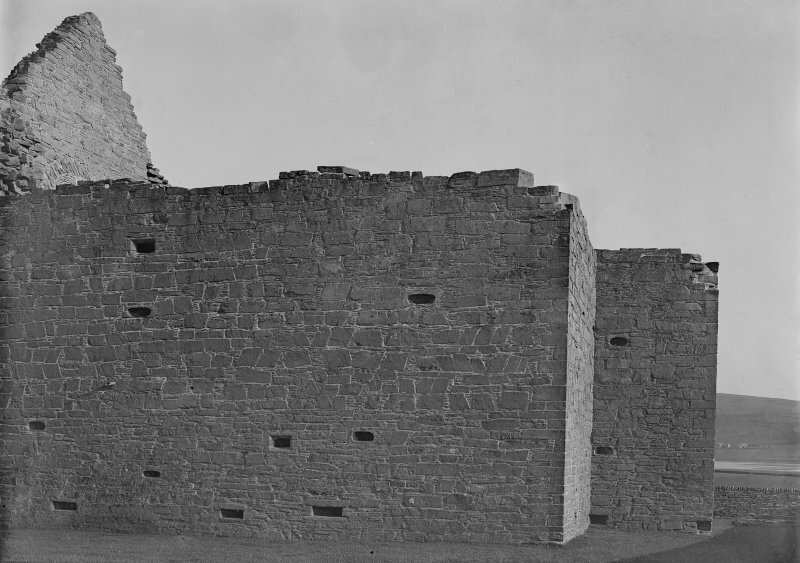 The remains of a late 16th c. Z-plan castle to which a range enclosed in a courtyard was added on the south in the 17th c; in the 18th c. other structures were erected outside the east and west walls of the courtyard. 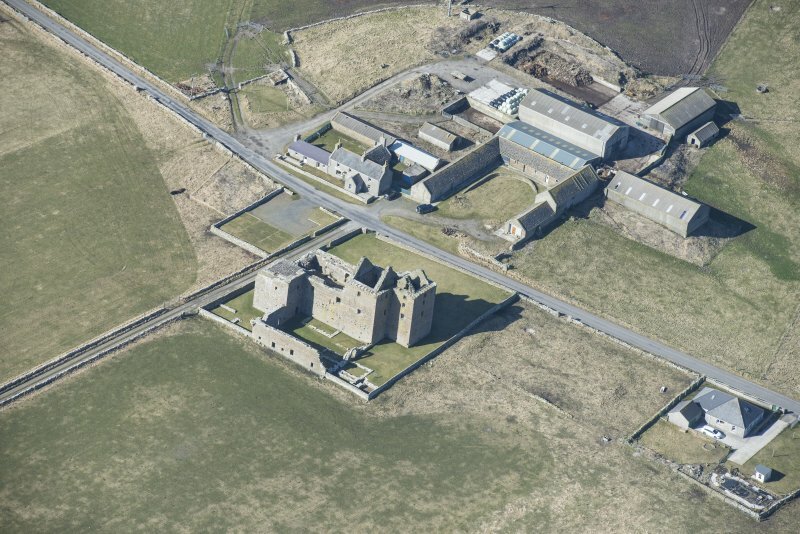 Simpson reasons that the castle was founded by Gilbert Balfour of Westray and is of the opinion that the main work was probably done on it between 1560 and 1572, but was never completed. 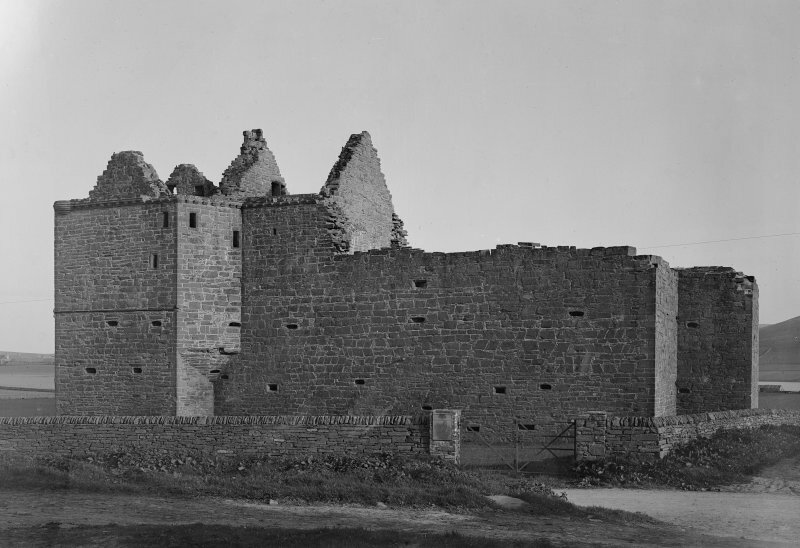 The building is in the custody of the M of PB&W, during whose excavations an early graveyard was disclosed adjoining the west side of the castle. 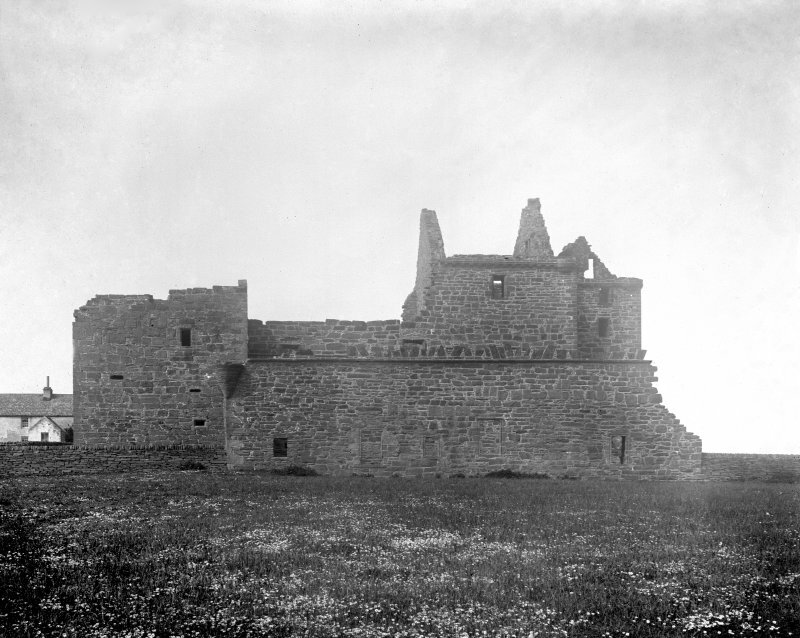 The castle is said to have been fired by Covenanters in 1650. 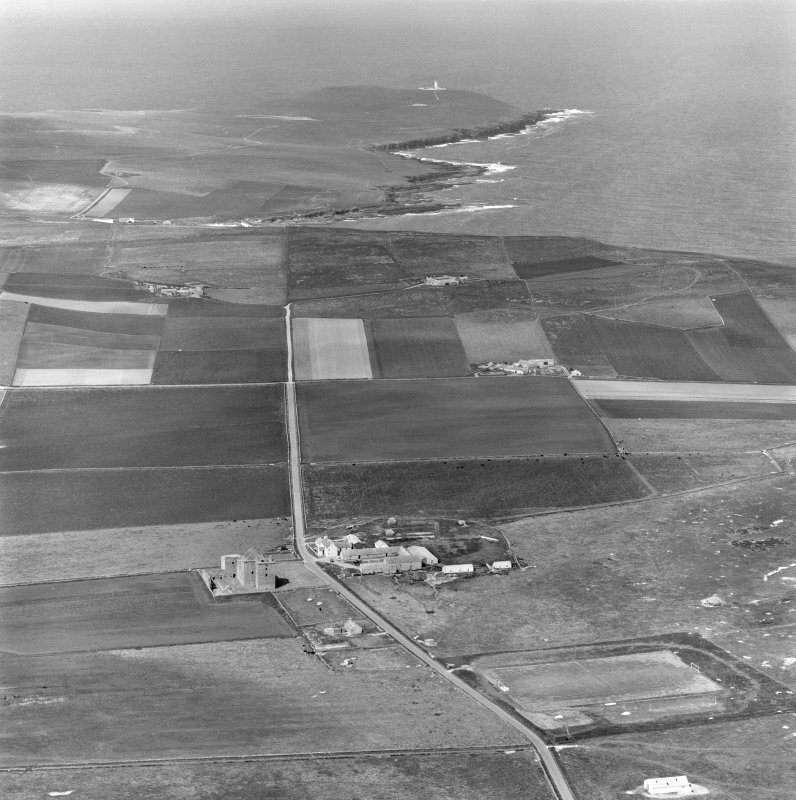 RCAHMS 1946, visited 1930; W D Simpson 1952. Noltland Castle, as described, planned and illustrated. Visited by OS (RL) 29 June 1970. HY 4292 4868 A minor excavation was undertaken in October 2000 at Noltland Castle (NMRS HY44NW 1), as part of a programme of installing underground electricity cables. No significant discoveries were made. 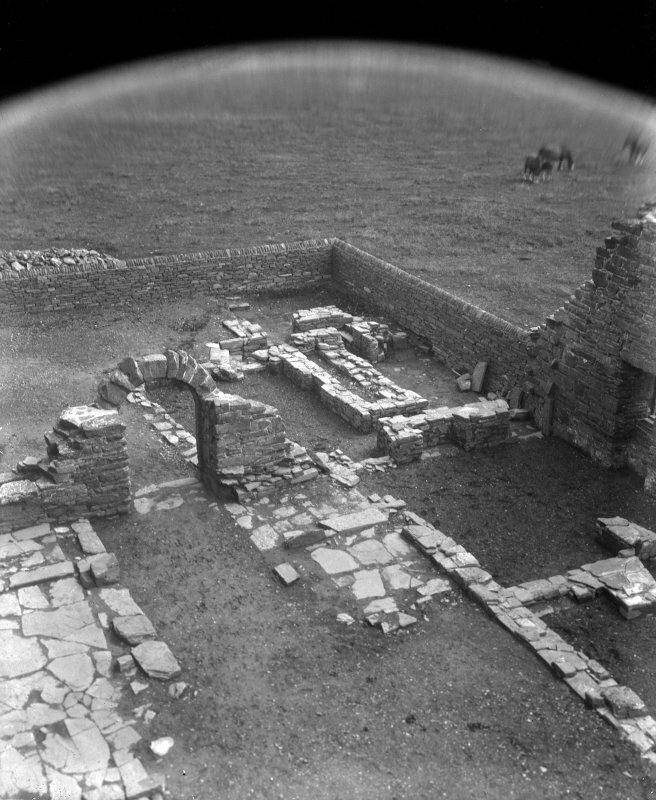 The excavation of skeletons in 1873 and 1874 was reported in 'The Orkney Herald'. Miscellaneous: Dr Thomas Ross - manuscript notes. 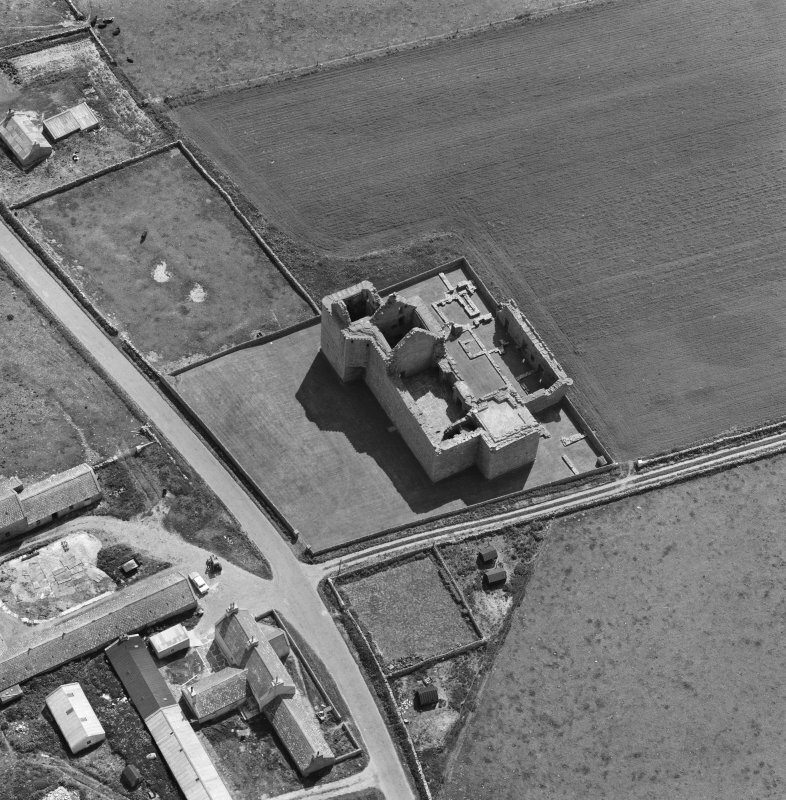 Oblique aerial photographs of Noltland Castle, Westray, taken by John Dewar in 1971. 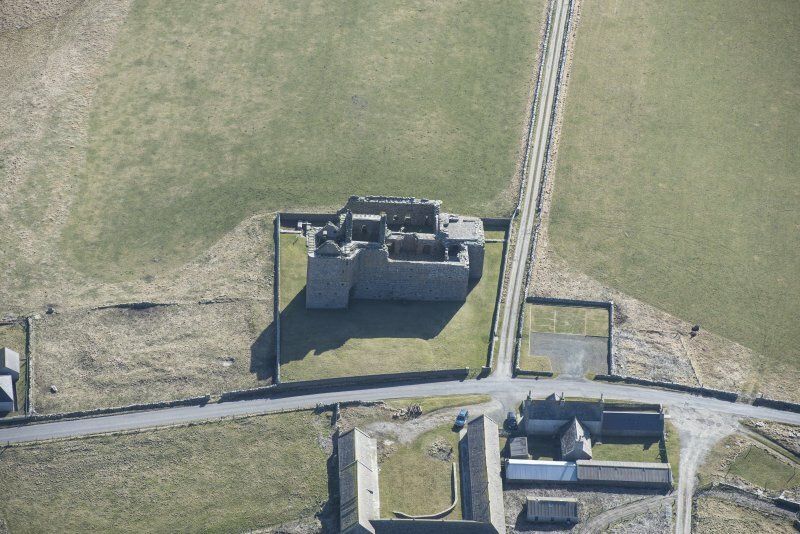 The siting of this most impressive castle emphasises the importance in former times of the natural harbour at Pierowall, and the height of the parapet provides an extensive view of the northern isles of Orkney. 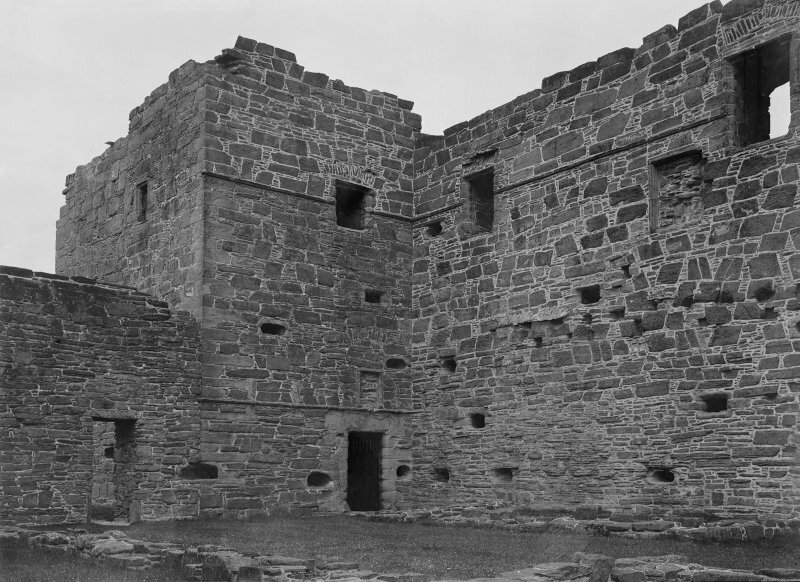 Most of the building uses the local grey flagstone but the finer stonework consists of red sandstone which was probably imported from Eday, a short voyage to the south-east of Westray. Though roofless, the castle survives in good condition, desp ite the fact that it was never completed, and it is an excellent example of a 16th century Z-plan design with a central block and two towers. Most remarkable of all is the number of gun-loops, no fewer than 71 arranged in tiers, mak ing it an unusually fearsome building, which was probably their prime purpose. 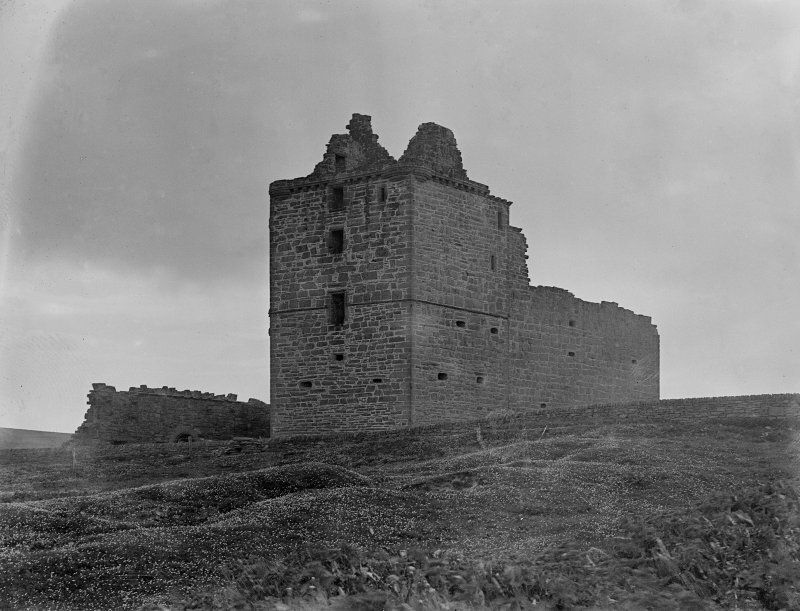 The main rectangular block measures 26.5m by 11m and, though incomplete, was designed to have three upper storeys, with square towers at its south-west and north-east angles; the south-west tower is slightly bigger at 9m square than the north-east tower, presumably because it enclosed not only the entrance but the main stairway. Although initially the castle looks very severe, there are decorative details. 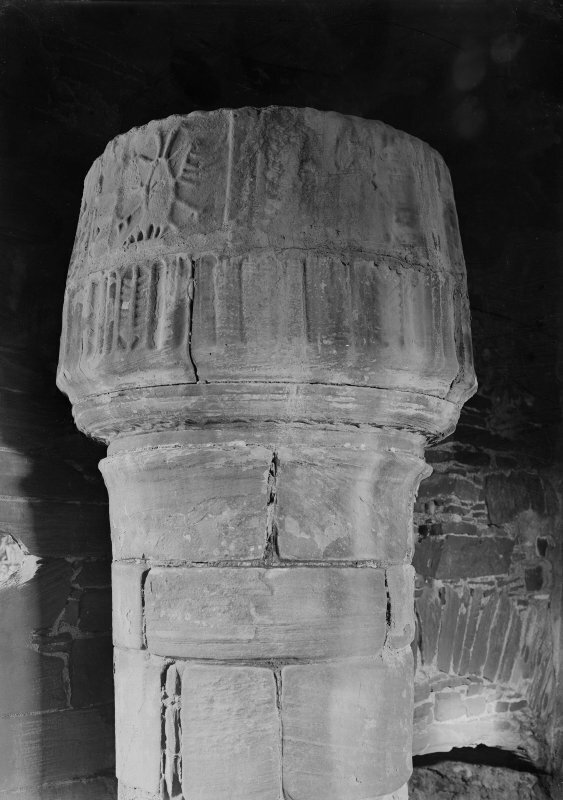 The lower string-course on the south-west tower is moulded and bears traces of carving, while the moulded panel above the doorway would originally have held a carved armorial panel, and at the well-head there were once turrets and a parapet walk supported by the decorative projecting corbels that still survive. The gables were stepped. 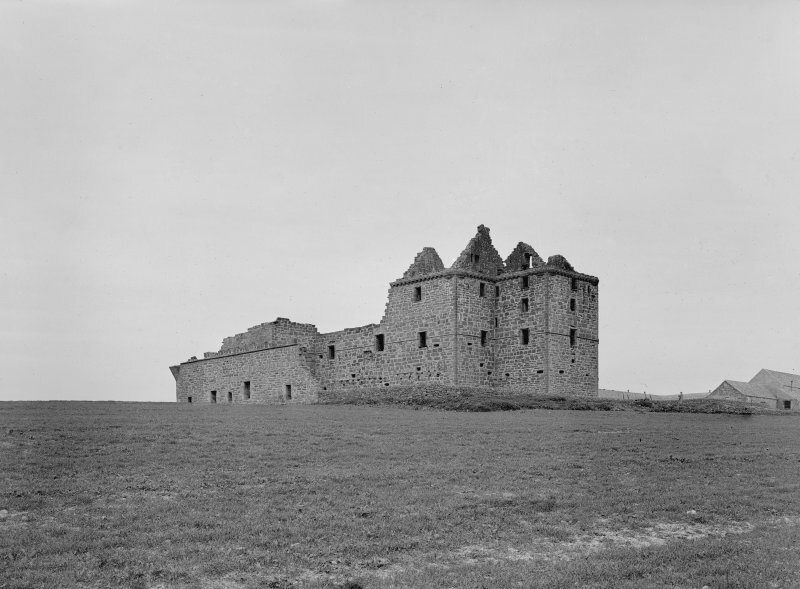 The inside of the castle, at least on the upper floors, must have been quite elegant to judge from the proportions of the main hall and the spacious design of the stairway, one of the finest of its period in Scotland , leading from the entrance up to the hall. The central newel of the stair is finished at the top with a great carved stone terminal. The hall may also be reached by a back stair from the kitchen below to a small servery where finishing touches might be added to meals about to be served in the great hall (a convenience not matched by conditions in the kitchen, which must have been very dark and stuffy). 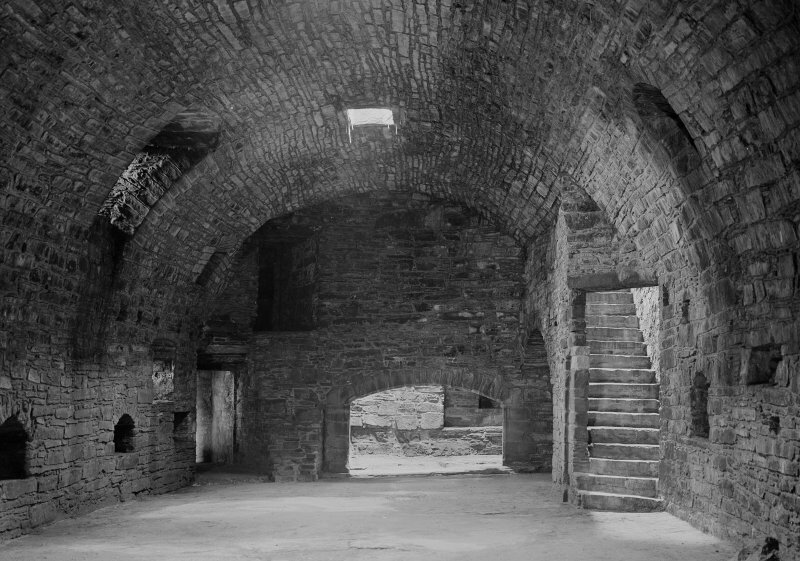 The basement was originally divided into two levels by a wooden floor creating storerooms between the kitchen and the vaulted stone ceiling that supports the hall and chamber on the first floor. The passion for gun-loops, which are such a feature of the castle, even extended to placing two in the wall at the back of the huge firep lace in the kitchen. It is worth examining the gun-loops in the basement, because many have slots designed to hold wooden mountings for the guns. 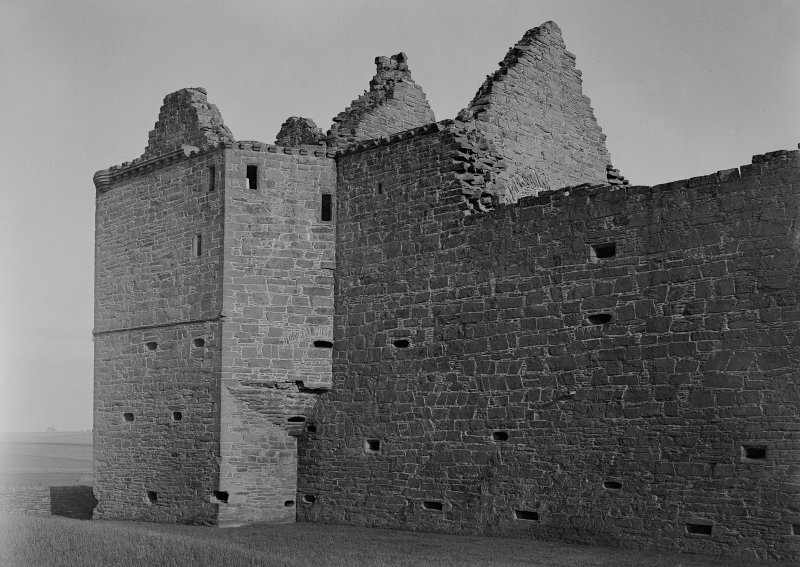 On the first floor were not only the hall and the laird's private apartments but also, beside the stair in the south-west tower, a small chamber that seems to have acted as a strong-room, because there are lockers with secret compartments built into the sills of the two windows. The courtyard on the south side of the castle with its arched gateway and foundations of domestic buildings is a later addition, described in an 18th century document as a 'garden'. 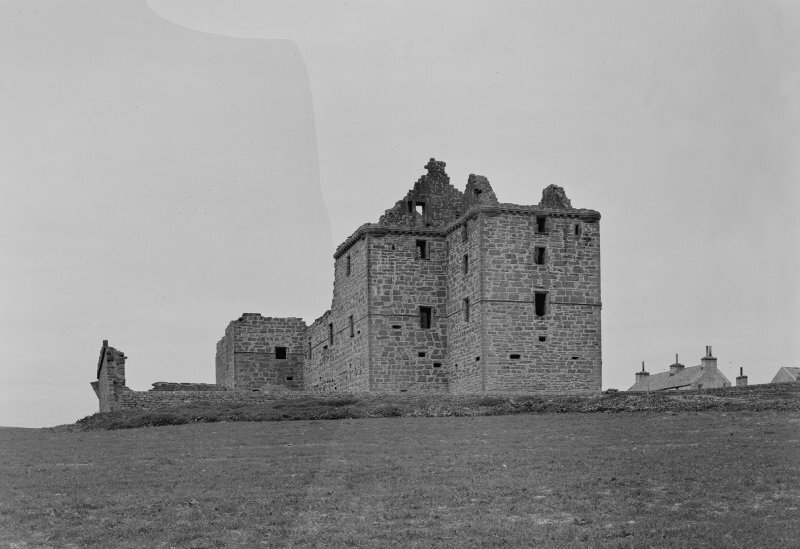 The castle itself was built sometime between 1560 and 1574 by Gilbert Balfour, a Scot from Fife with a particularly ruthless personal history, who had acquired through marriage lands in Westray in 1560. 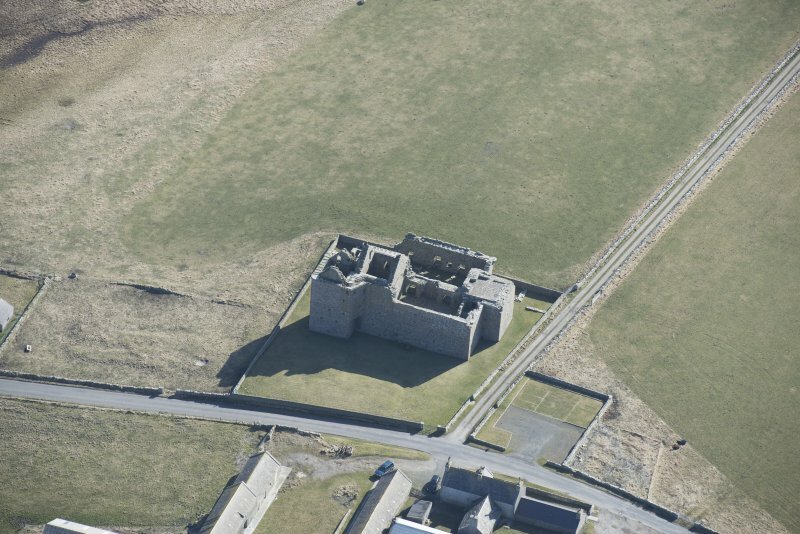 Despite the fact that Noltland was never properly finished, it was used for at least two centuries both as a military stronghold and as a residence. 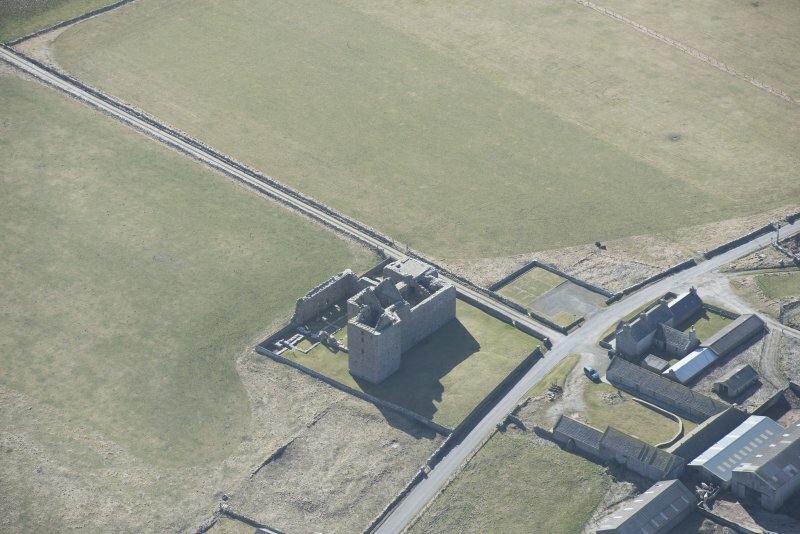 A minor excavation was carried out at Noltland Castle, Westray as part of a programme of installing underground electricity cables. The line of the cable followed an existing cable put in place in the 1980’s. As predicted a plastic conduit pipe is already in place beneath the surface of the grass of the scheduled area W of the castle main structure. 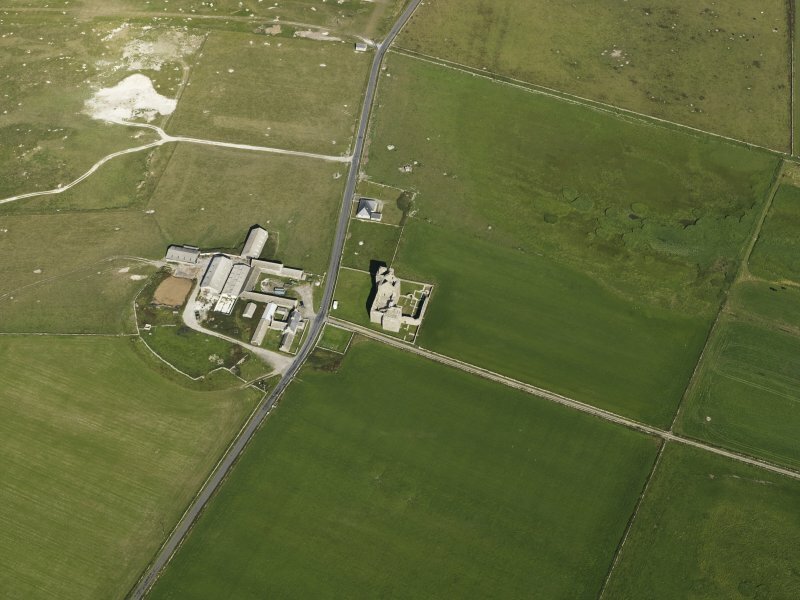 The excavation revealed it to be 0.5m below ground level in a trench presumed to be 650mm deep. The conduit seems to be in good condition. Ultimately the test pit might prove useful if running the new cable through the conduit proves difficult, in which case access holes will probably be dug by MCU on both sides of the castle wall. Nothing of archaeological significance was found. HY 42944 48695 A gradiometry and resistance geophysical survey of c0.25ha was carried out on 1 December 2012 prior to the development of a new car park. 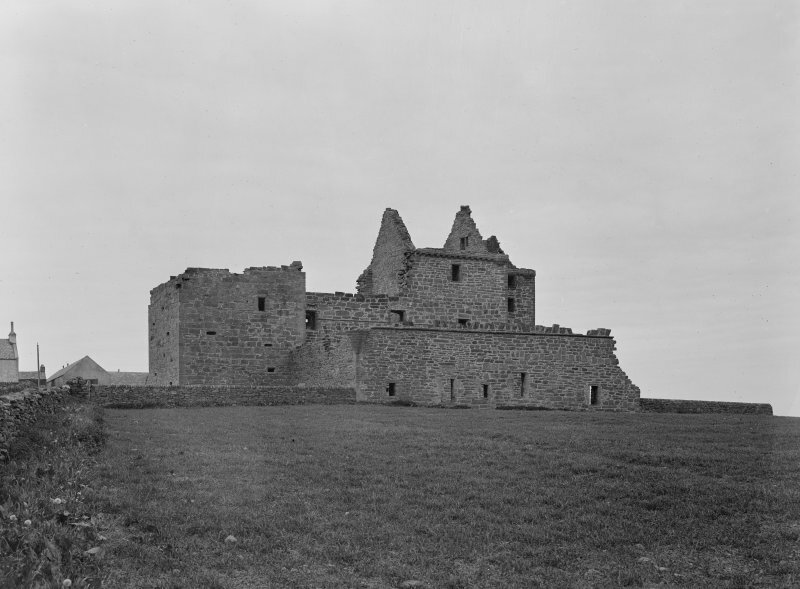 The castle is a late 16th-century Z-plan tower with later additions to the S, E and W. Excavations have suggested the presence of a graveyard to the W of the castle. 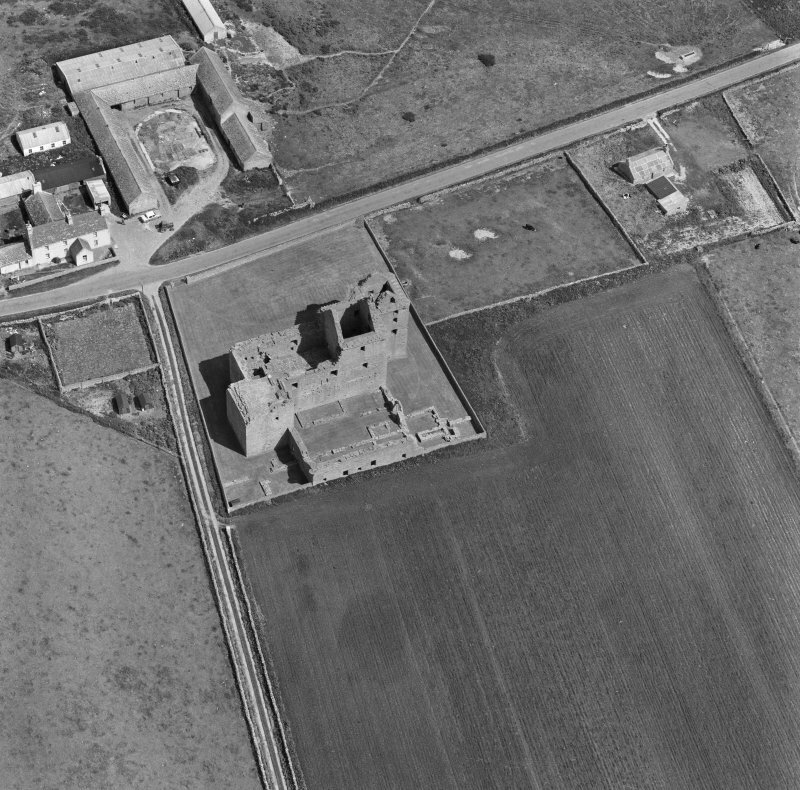 The main survey covered the whole of the castle compound; a second area immediately to the W of the property was also surveyed. 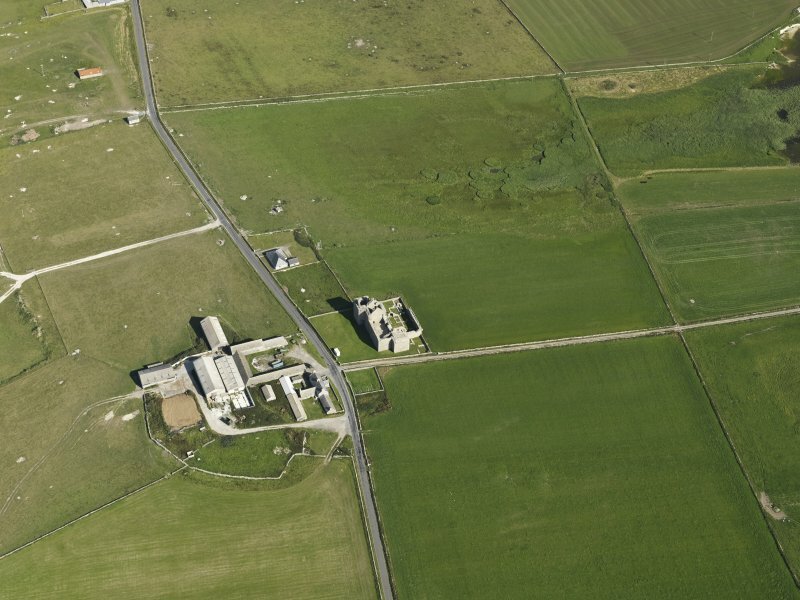 The data in the NE part of the survey area is dominated by responses from earlier farm buildings and boundaries, which today survive as a prominent earthwork/platform. 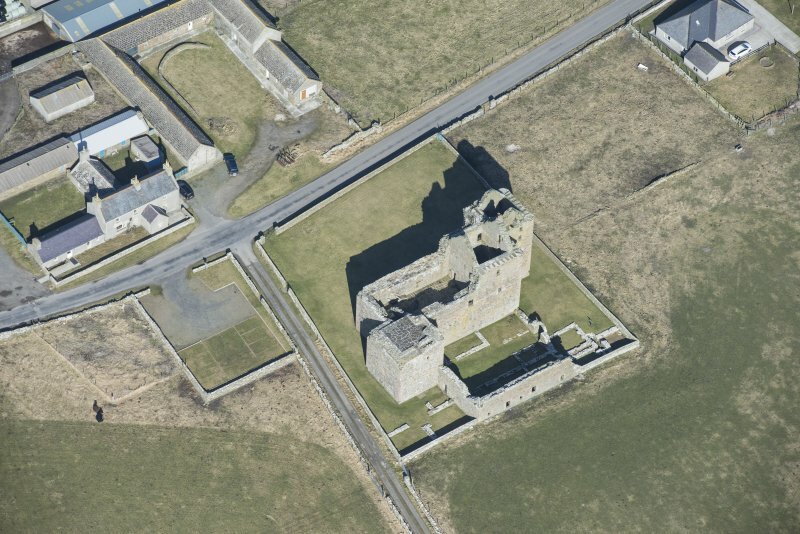 No clearly significant anomalies were located on the lawns surrounding the castle. 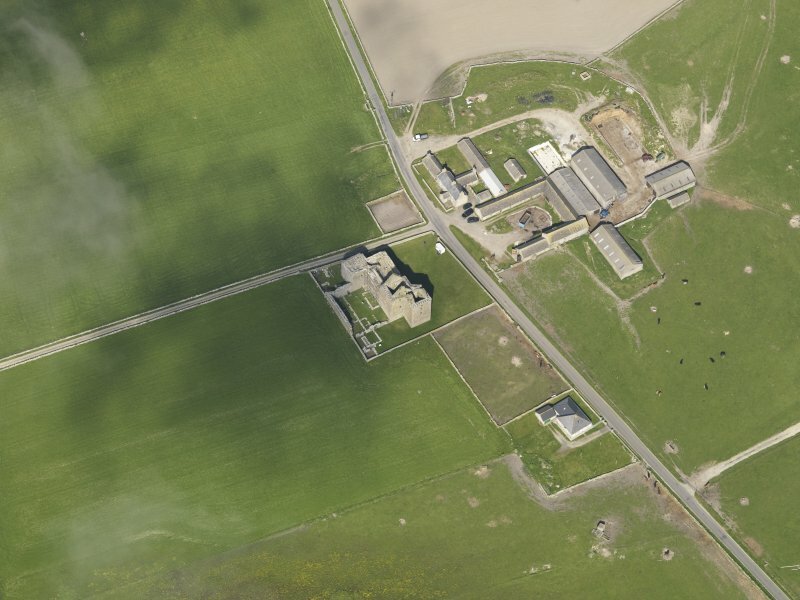 The survey within, and immediately S, of the walled garden to the W of the castle identified some anomalies of possible archaeological interest, including the suggestion of an oval high resistance response. However, the limited size of the survey area, together with modern use of the area as a garden/allotment, makes any interpretation tentative. by Gilbert Balfour and dating 1560-72, but probably unfinished. courtyard on the north side of the Castle. this will help is to fix the date. of the castle or burial ground.